CertainTeed Corporation has purchased the Hunter Douglas North American ceilings business, increasing its presence in the architectural specialty market. Building material manufacturer CertainTeed Corporation has completed the acquisition of Hunter Douglas’ North American ceilings business, adding to the CertainTeed Ceilings division. 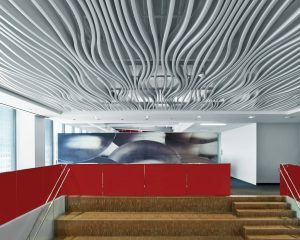 With a specialization in acoustical ceiling and wall solutions, the acquisition will allow CertainTeed Ceilings to further diversify and increase its presence in the architectural specialty market, via Hunter Douglas’ product portfolio. The Hunter Douglas ceilings business includes a comprehensive line of metal ceilings, walls, and exterior soffits; large format acoustical panels; and a line of felt ceiling and wall systems. As part of this transition, Ron Rice will continue in his role as general manager of Hunter Douglas Ceilings and join the CertainTeed Ceilings management team.